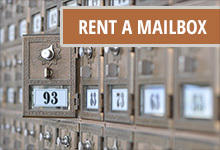 New Customers: Use our Rent a Box page. Want to make a one-time payment? Click here. Note: “Names” refers to the number of individuals and or business names receiving mail at a mailbox. If you have any questions regarding how many recipients are on file to receive mail at your box please call (310)450-4479 or email info@smmailboxes.com. Every business owners needs affordable quality products and services. Contact us to have your business included. Corner of Centinela Ave. & Ocean Park Blvd. Find out a little more about who we are. © 2014-2017 Santa Monica Mailboxes & More | All rights reserved.